The project is designed to span five years. The first year is focused on data compilation for framework development, water use, and history-matching criteria as well as the beginning construction of initial model datasets, including both the history-matching (calibration) model datasets and the forecast/scenario model datasets. 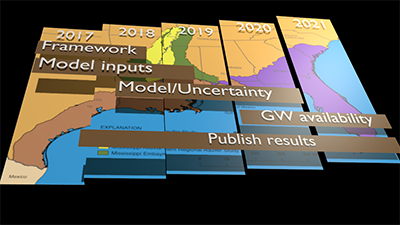 The second year will be focused on updating the conceptual model, completion of initial model datasets, development of the prior uncertainty distributions for the model parameters, preliminary uncertainty analysis, and refinement/construction of more complex model datasets. The third and fourth years will be focused on conditioning of the model to historical data, application of non-linear uncertainty analysis, initial evaluation of both groundwater availability and the monitoring network, and publication of these results. The fifth year will be used to focus the modeling analysis on the topic of groundwater availability in regards to status and trends and future projections, as well as completing publication of the remaining products (professional paper and fact sheet).